I was in Chicago for 3 nights and 4 days for work. However, I only had 24 hours of personal time to satisfy the wanderlust bug. 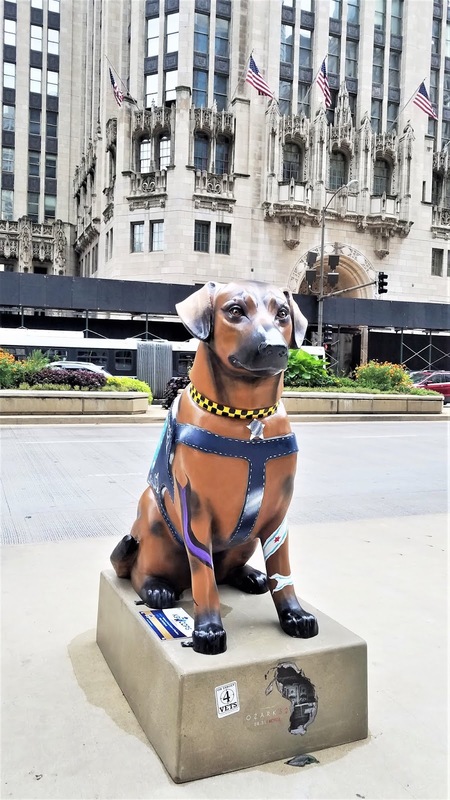 I arrived on Thursday afternoon and I had until 6:30 pm the next day to explore downtown Chicago until work officially started at 7:00 pm on Friday where we had a reception to kick-off the meeting. Saturday was work from 8:30 pm to 5:00 pm. I had my flight at noon on Sunday which really meant Sunday was just for sleeping in a little before I had to get to the airport at 9'sh in the morning. My time for exploring was indeed very limited. After 4 1/2 hours of travel from San Francisco, California, I arrived in Chicago at almost 3 pm. Rush hour has already started. We were advised to take the subway to the hotel which is very conveniently located just 2 blocks away from the station. I opted to take the cab. My fare was $60 compared to my colleagues' train fare which was just few dollars! I was just too tired from the flight and I did not want to deal with the public transportation system in a new city. As soon as I checked into my hip hotel, (read my post here), I took a shower, changed and ventured out. I was determined to see The Bean Sculture, an icon of Chicago which is located at the Millennium Park. I have never been to Chicago before and I was in awe as I gazed at the tall skyscrapers way up above me. I never expected this scenery. (But then, I did not have any expectations of what Chicago would look like.) I felt like a teeny ant as I was surrounded by massive and imposing looking buildings all around me. Chicago is overwhelmingly expansive with the river and tall buildings wrapping at least this side of Chicago where I was at. This is a totally different architectural landscape from where I am from which is the San Francisco Bay Area. One of the great things about traveling is stumbling upon the unexpected. I have not done my research on Chicago except The Bean. Honestly, Chicago was not on my mason jar list because I really do not know much about it except the Sears Tower, Wrigley Park, Chicago hot dog and deep-dish pizza. My boss told me to check out the river. 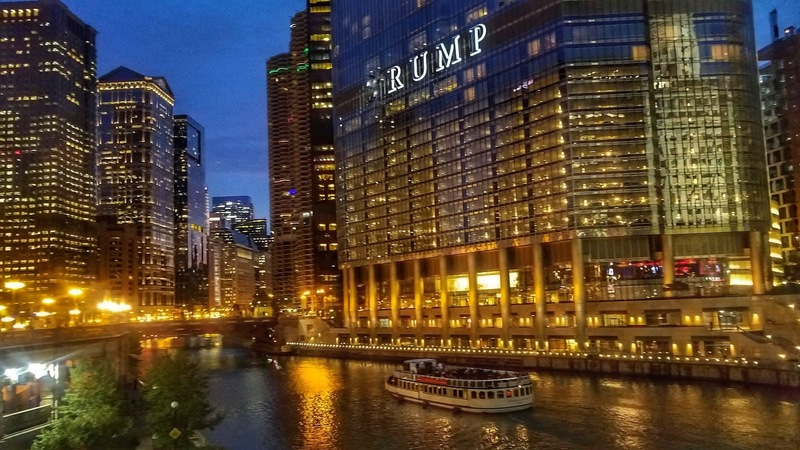 Sure enough, on my way to Millennium Park I ran across this magnificent river! It was turquoise in color and there were cruise boats sailing on it as it was being draped by tall buildings on all sides. It was a sight to behold! I kept on walking back to this river all three days that I was visiting just because it was really breathtaking. Each day I saw couples posing for their wedding pictures being followed by professional photographers. I considered taking a river cruise but I decided against it. 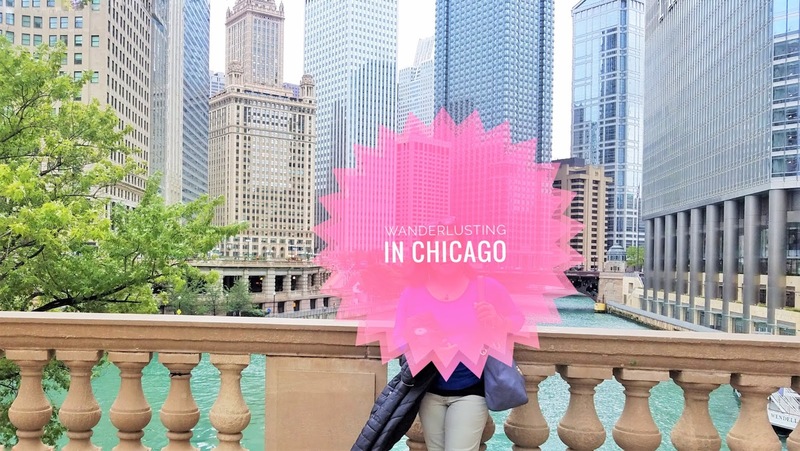 I only had very limited time in Chicago and I did not want to pack it all in. I hope to go back and go on that 2 hour cruise with Mr Sweetie someday. Can you find me on The Bean? It was a 20 minute walk from my hotel to the park. When I reached the park, I still did not know where to find it. I asked friendly locals who told me to just go up the steps and sure enough, situated in the middle of the park is this giant fascinating monstrosity. It was what it was nicknamed -- The Bean. 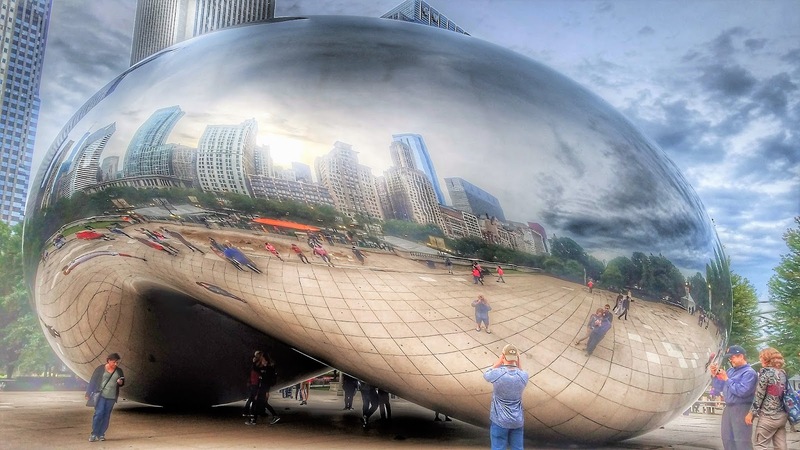 It was a giant metallic bean that mirrors the Chicago skyline in an artful distorted imagery. And it was the most perfect selfie/Instagram whatchamacallit in city of Chicago. Since I was by myself I spent a considerable amount of time entertaining myself taking bazillion selfies, pictures and just people watching. I also video-called Mr Sweetie to show him The Bean. Needless to say, it was a perfect free entertainment in Chicago while satisfying your culture-vulture, I guess. I only saw a very small portion of Millennium Park. Doing my readings now, it is humongous and full of architectural wonders. It is also considered a city oasis. I can see that from what I have seen so far of the park which were the fountain, a giant squiggly sculpture and The Bean, of course. I was still too tired from my flight that I could not go any further to explore. After walking downtown and seeing The Bean at close to 7 pm, I headed back to my hotel room. From my hotel were tons of department stores such as Bloomingdales, Forever 21, Nike, etc. Chicago is great for shopping. We have them all in San Francisco so I was not very interested although I could not resist popping into Forever 21 since it was just around the corner from my hotel. I was fascinated even by the chain restaurants that we do not have in the Bay Area such as Stans Donuts and Wow Bao. I also saw a couple of restaurants that I have seen on the Travel Channel. I mostly had casual eats in Chicago. Here is the post on my adventures in Chicago (cheap and casual) food scene. On my first night, after strolling downtown on foot and visiting The Bean at the Millennium Park, I grabbed buns at Wow Bun and a couple of donuts from Stans Donuts. I went back to my room, changed into my pjs, grabbed a beer from the stock bar, ate my dinner and stared at the skyscrapers outside my window until I fell asleep. I was happy that I got to see quite a bit on the few hours that I have been to Chicago. You are in Chicago, you gotta eat either a Chicago-style hotdog, deep-dish pizza or both. Deep-dish pizza originated in Chicago, most specifically at Uno Pizzeria. This original location was on the same block as my hotel! I saw the plaque on the restaurant's wall touting Uno as the birthplace of Chicago-style pizza. Well, I am lactose-intolerant. I really could not chance eating dairy when I have an all day meeting to attend or a flight to catch. I opted for a hotdog instead. Honestly, I like hot dogs better than pizza. 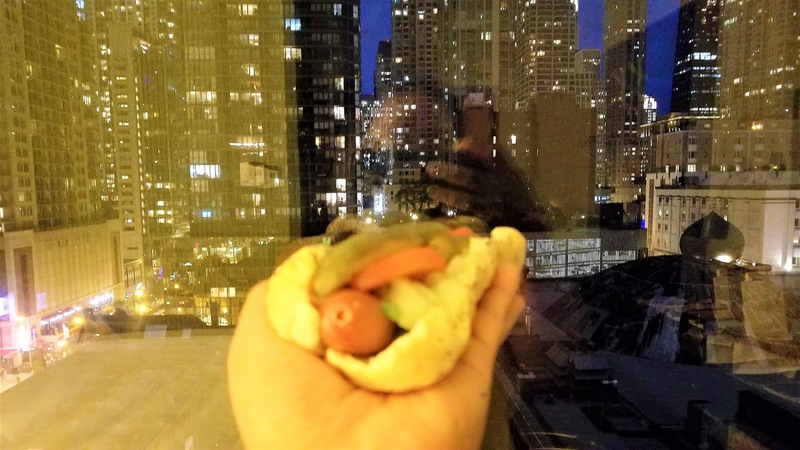 After a long day of work on Saturday and my last night in Chicago, I researched where to get a hotdog. I found Portillo's as one of the best places to get a Chicago-style dog. It was about 6 blocks from Acme Hotel where I was staying. It was more on the backstreets than glitzy downtown. Portillo's also looked like it belonged in small country town in Texas with its country/quirky decor than the urban jungle that is Chicago. Needless to say, I satisfied my foodieness with this hotdog. I took it back to my hotel room and ate it there with a bottle of cold beer and a bag of chips. It was great! I actually wished that Mr Sweetie was with me. He would have really enjoyed the hot dog and the vibe. So, what is Chicago-style hotdog? It is explained here. I also grabbed a bag of popcorn from Garrett Popcorn Shop since I recognized it from watching the Travel Network. I took a bag home to Mr Sweetie and he was happy. Eat a steak. Chicago is supposed to be known for its steaks. I walked by Michael Jordan Steakhouse and it has good reviews on the web. I would definitely take the carnivorous Mr Sweetie here if ever we get a chance to travel to Chicago. Take a river cruise. Romantic from what I have seen so far! Go to Lake Michigan which I was told was not far from where I was but I did not see it. Take that famous ride to the top of Sears Tower. Get out on the ledge if you dare on the 103rd floor. Okay, now I really want to go back to Chicago with Mr Sweetie! Spend a lovely afternoon at the Navy Pier, a Chicago landmark that has been around since 1913. *These are now all on my Mason Jar List. So, 24 hours give or take and I am happy with what I was able to cover. I am also the type of traveler where I need equal amounts of relaxation and exploration. I would rather fully enjoy one attraction or activity than see a dozen without really getting to digest the experience. I do hope to visit Chicago again for pure pleasure, and this time with Mr Sweetie. What type of a traveler are you? Are you the must-see it all in one trip or the laid back kind? 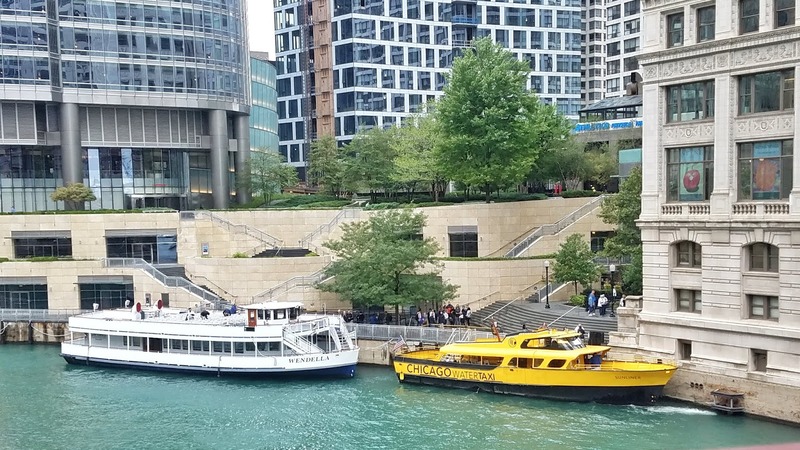 My next post is going to be on places to eat in Chicago's River North neighborhood.